The goal of designing a successful logo is to create a memorable design that is easily recognized, scalable, and readable at different sizes. I have designed logos for many different types of businesses such as, medical, legal, food and beverage, fitness and health, music and entertainment, and much more. Each company has it’s own unique standards, colors and fonts that builds brand recognition and sets itself apart from other businesses. 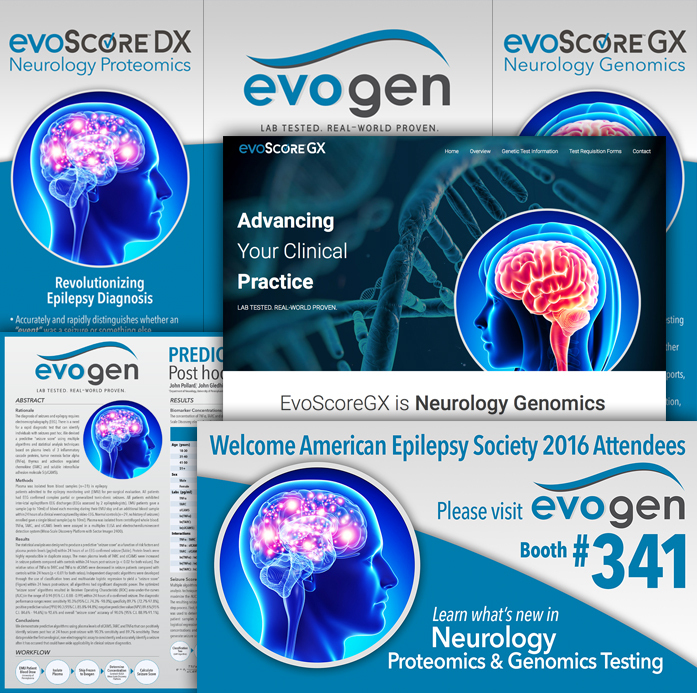 Evogen, Inc. is a Medical company whose business is Genomic testing. Various projects included trades show banner graphics, scientific poster design, postcard mailer, and a responsive parallax website. Using Evogen’s logo, color palette, and font standards, I created a consistent brand identity throughout each of the projects. Using a subdued color palette of teal blue and grey, and combining that with the vibrant medical imagery, makes for a striking visual statement. Each individual project by themselves can be recognized as part of the Evogen family further reinforcing the company’s image. Call today, if you need a branding professional for your projects.